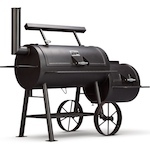 Yoder Smokers Community Forum • View topic - Charcoal Basket; can it keep temps high enough?? 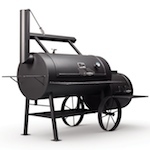 Hey all - I've read where folks can maintain a long burn time in a side box smoker using a charcoal basket (often following something called "the minion method"). Folks at another BBQ forum however tell me "no way this works". Is anyone doing this? 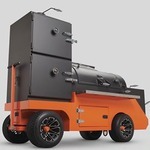 ...or perhaps the better question is, what IS a charcoal basket used for in a side box smoker? Thanks for any and all info (newby here). Re: Charcoal Basket; can it keep temps high enough?? Yes, it works fine, but, depending on the temperature that you are wanting to cook at, the length of time may not be what you are wanting. 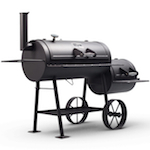 Yoder-Herb; what other stick burners are telling me is that the so-called 'minion method' is for WSM or ODS smokers, not side box smokers. They claim there is no way to maintain a minimum temperature of 200F (or so) using this method and that cooking with splits of wood will be the only way to do this. Does this sound about right to you? That said, I think I'd still be interested in a charcoal basket to provide other options for using my Wichita. They are obviously not Yoder owners. Yoder makes the charcoal baskets as options for Yoder stick burners, as I previously posted. I used mine for the first time yesterday with Weber briquettes also six healthy sized pecan chunks mixed throughout. Maintained temps at 235-260 ( grate temps )with the vent 1/3 open for a solid 6 hrs. It took close to an hour to heat up with the door wide open once the basket was started. I had to add coals for the complete cook of a total of 10hrs, brisket point along with whole chicken, dozen thighs, 24 poppers, brats and hot links. Worth the $ for me learning this new loaded Wichita. Weber briquettes are bigger, burn hotter than KBB. Sorry for the very late reply, wow. I run the basket on top of the grill grate. I also start the coals at the door side and when I add coals it’s just poured on top of what’s burning. It just kept burning but I had a ton of ash on the left side so I guess the door side was letting enough air in. I’ve only used it twice and the last time was ribs so it wasn’t a long cook. SteveSmokes wrote: Sorry for the very late reply, wow. The coals should be started from the cooker side, not the door side. This will allow a more efficient and longer burn. If the coals are ignited on the door side, the draft will pull the fire through the coals, loosing efficiency and burn time. It works just fine starting at the door for me, how high are you filling it? I pour it level with the top. SteveSmokes wrote: It works just fine starting at the door for me, how high are you filling it? I pour it level with the top. Yes, it will work fine starting from the door end, but the coal will burn much faster. So what is the best way to add coals when you’re going over a 5-1/2 hr cook? I can hold and maintain temps by adding coals to left side and keep burning away where I would think adding coals to the damper side closes off air flow without using the ash clean out tool. I guess I’m lazy... I never clean ash out until the next day. What is the amount of cook time gained by the efficient method? I’m pretty happy how the product works for my money spent. Sorry, all I got was a receipt when I bought it ( no instructions) and I’m pretty happy with it. And I left a very positive review on my Loaded Wichita for the simple fact it works well with the basket. Interesting video I found reminded me of this thread. It works just fine for me and helps contain the mess. I don't use it as a overnight cooking tool. All that lump or whatever would be a ton of ash it seems. I just add my wood sticks and it burns nice and clean and maintains my temps nicely. Will be doing 2 pork butts on Xmas day. My issue was maintaining a descent fire without the HM plate in. Now I put the plate back in and it just helps me maintain a better fire. Cannot Load a Pic of it in action. Load pic seems to not be working right now. Thanks for all your help with this learning experience. I now love this Bad Boy and the cook is just awesome! !